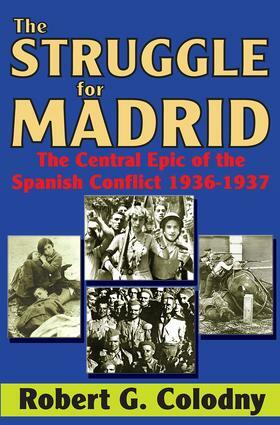 The Struggle for Madrid is a study of the battles that were waged between the armies of the Spanish Republic and the armies of General Francisco Franco for the city of Madrid. It was this struggle, beginning with the collapse of Republican arms at Toledo in September, 1936, and ending with the victory of the Madrid armies at Guadalajara in March, 1937, that determined the duration and characteristics of the rest of the conflict. It was the central episode of the Spanish War. Due to international intervention, the Spanish struggle lost its purely national character and became at once a civil war of a profoundly Spanish type, a war of independence waged by a section of the Spanish people against German, Italian, and Moroccan armies, and a clash of supra national ideologies that aroused the deepest passions of peoples far removed from the immediate Spanish interests at stake. Although the passions aroused by the war distort contemporary accounts of the fighting, the totalities of these obstacles present no insurmountable barrier to a preliminary investigation of the Madrid battles. Such a study is best undertaken while many of the principal actors in the Madrid tragedy still live. If truth has been affronted the witnesses may yet speak, and from the debate margin of error will be reduced. Robert Colodny's groundbreaking cross of military history and political ambitions helps reduce the gap between fiction and fact.